There is something new and energizing at Cold Spring Church. We are building a culture of generosity and our mission helps to further our collective proclamation of God’s love in word and deeds that lives, communities, and the world are transformed. The session (leadership team), deacons (caring team), and staff, along with the members and friends in our worshipping community are making a difference every day. Thank you for contributing your energy, time, resources, presence, and financial support so that our worship, mission, and many whole-family, come-as-you-are, events continue to transform lives! 3. Would you recommend Cold Spring Church to your friend or a neighbor as a place to invest their time, gifts, and energy? Compared to this time last year, our worship and event attendance, membership, and team recruitment have increased. We are grateful to God for this new energy! I invited the congregation to participate in a live listening exercise on February 19th during my message Measuring the Mission from 1 Cor. 3:10-11. 45 respondents helped us capture a baseline of congregational engagement. We don’t want to build a mission strategy on guesswork or unreliable information. Results Preview: 5 reported less engagement now; while 6 reported their engagement remained the same year over year. But 34 (76%) reported more engagement with Cold Spring Church now compared to last year. This is great news. Our congregational giving is increasing, but so is our individual and corporate community support. Our Light Up The Future campaign was launched in December 2016 to renovate our historical chandelier that hangs in our worship center. It is the only artificial light source and it is in need of special attention to improve its condition and increase its illumination, while remaining a treasured historical piece. Our work with youth and adults requires light as we send them out as light into the world! To date we have received the following generous gifts for which we are deeply grateful. If you would like to join these donors, please contact the office today for more details. 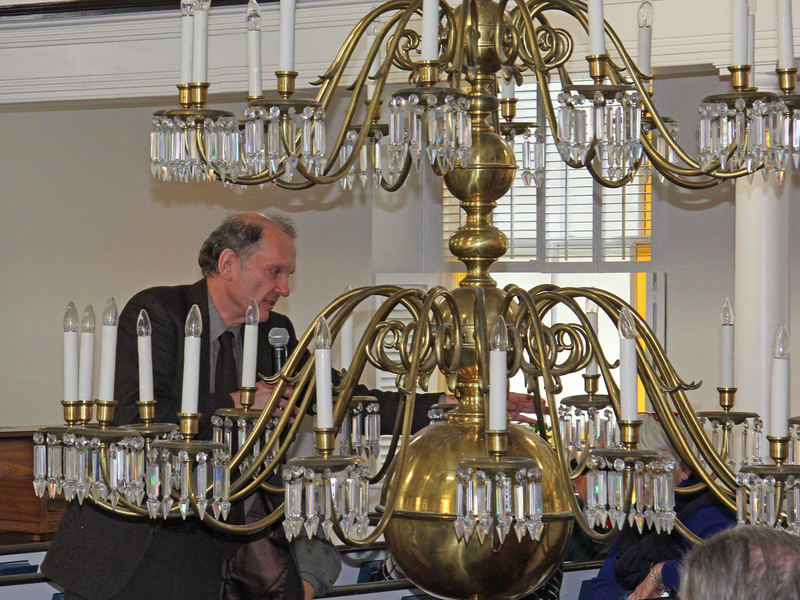 > Roland Wilbur of the Antique Lighthouse in Philadelphia examines the chandelier during an informational meeting.